SAULT STE. MARIE, Ont. – Brian Kment made 32 saves and Rylan Parenteau answered with 35 stops of his own as the Sault Ste. 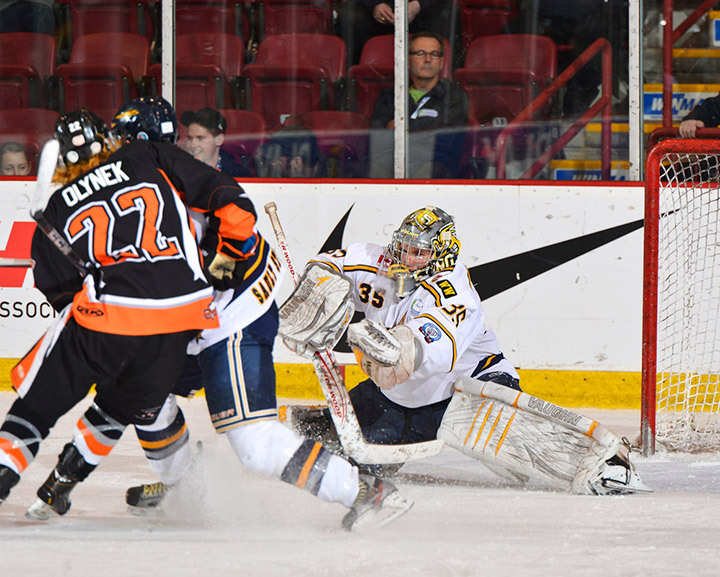 Marie North Stars and Saskatoon Contacts skated to a 1-1 tie at the 2013 TELUS Cup on Thursday night. The draw leaves Sault Ste. Marie (2-1-1) and Saskatoon (1-1-2) in a five-way battle for four semifinal spots heading into the final day of preliminary round action on Friday. Matt Pinder scored the lone goal for the North Stars, his tournament-leading sixth midway through the first period, but that would be the only puck to beat Parenteau, who made at least 10 saves in each period, including a baker’s dozen in the third when the hosts held a 13-11 advantage. Kolten Olynek replied just past the midway point of the second period for the Contacts, who played to a tie for the second day in a row, although Wednesday’s 5-5 draw against Red Deer was much more of an offensive showcase. Kment, who made 47 saves in his only other start of the tournament, a 4-3 victory over the Red Deer Chiefs on Tuesday night, was at his busiest in the first period, when he faced 14 Saskatoon shots. Overall, Sault Ste. Marie held a 36-33 advantage in shots on goal. The North Stars wrap up the preliminary round on Friday night against the Rousseau Royal de Laval-Montréal (4:30 p.m. ET), while the Contacts close against the winless Valley Wildcats in the afternoon (1 p.m. ET).